***NOTE: As explained in my last post, I was going to finish last year’s A to Z Challenge. Here is my letter “L”. When I was young, I used to think that “literature” was exclusively used to refer to stories or novels. I don’t know now how I learned more, but it was probably when I encountered the term “related literature”. I was a bit surprised that anything written (well, at least those with some value) can be considered literature. Based on this, it is either poetry and prose. That last part was the kind of information that most surprised me when I learned about it. Leaflets and advertisements were far from my mind. That was mainly because whenever I thought of the word before, I thought of value and merit, especially artistic merit. That was how most of us were brought up. It was so old-school that even anything that’s not artsy was generally disregarded as literature, no matter how valuable the information it contained. Anybody can be a critic, but it does not necessarily make him right. If anything, this kind of thinking was developed during the times when people were concerned more about social strata and social snobbery. We put the word “literature” in a box — No, this is just you, Lit. You can’t be some leaflet or thing that anyone just thought he’d write and call Lit. The nerve! You say toh-mah-toh, I say toe-may-toe. Basically, it all boils down to the person appreciating it. How do YOU define literature? I could have written more about it, but I fought off my tendency to write long posts to keep you interested. I hope you liked it and share your own thoughts in the comments below. This piece serves as my Letter L post for the A to Z Challenge 2017. I learned to write fiction first by writing in script form. That means, except for a very few and brief inclusion of actual descriptions enclosed in parentheses, my stories were 95% dialogue. Some friends liked the stuff I wrote, though. Well, they were kids, too, so it was not hard to impress them. The nice thing about it was even with the absence of actual storytelling, the dialogues worked. My few readers understood the stories, liked them even somehow. Why? Because the dialogue has its own specific and important role in literature. Years ago, I learned of this. I cannot recall from whom or where, but I learned that dialogues are essential in a story. Novels need them, be they fiction or non-fiction. Dialogue makes interaction between characters more natural. Without dialogues, can you imagine how it would be like? Sure, you can write them this way: She told him he was very wrong. Fair enough. But if you were a reader, how would you like to read something like this one? She told him he was very wrong. He told her that he was right. She answered back saying he had to prove it. The man then accepted the challenge and said he would be back. 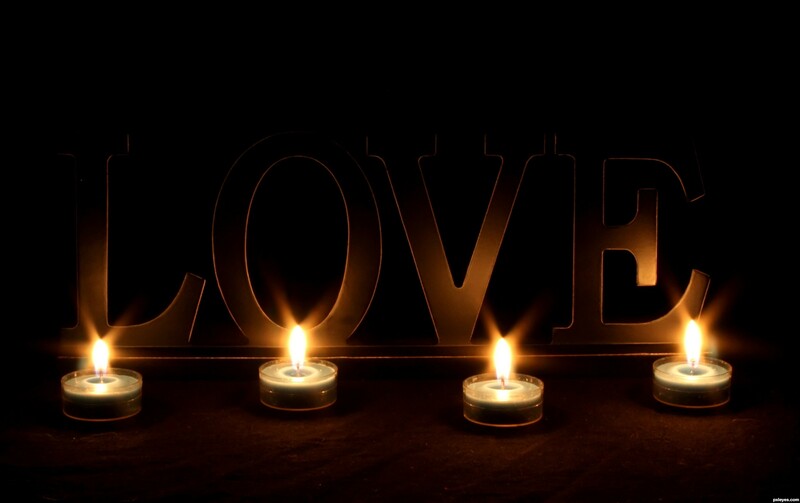 Before he left, she reminded him that…. Oh, my. Major headache, that’s what one will get if he reads a whole book without actual dialogue. It’s not just boring, but rather annoying. Even if the character is supposed to be mute and doing sign language, you must be able to let the readers know what it is the character is telling somebody else. This is in written form, folks. There is no other way for your readers to see the actions. It is up to you to make them see–and hear–the character in their heads. Dialogue adds “character” to the character. It makes the reader understand a character better. Dialogue gives him personality, background, attributes, etc. If he talks with a certain accent that is recognizable through how the words and even grammar are written, the reader can immediately gauge from where he’s been, maybe get an idea of what his morals are, his beliefs, other things. Like if he sounds Texan, maybe he carries a gun. This is not merely stereotyping, rather a part of characterization. In fact, you can make him more interesting by making him different, like he’s a guy who has never held a gun in his life–that would be an interesting angle. You can even let details about the character be known through his indirect words. For instance, one of my inspirations for Maya, the main character in my story, is Dr. Temperance Brennan a.k.a. Bones. Brennan is a genius who likes to share and insert trivia and stuff in conversations. So by letting Maya talk and talk about trivia and stuff that she learns from her doctor-friend (who does most of the forensics talk, naturally), I let the readers know that Maya’s got the brains, too, and that she could also be a tad like a know-it-all sometimes, like Brennan. Dialogue fills in the void. When something about the character or what is happening to him is not explained clearly, whether done by the writer intentionally or not, dialogue reflects the character’s thoughts and feelings. It makes him more human, or in the case of fables and children’s stories where animals and non-living things talk, more human-like. Through his words and by the way he says them, that gives the reader an idea of him. How does he communicate? How does he speak to others–is he rough, angry, soft-spoken, prone to using coarse language, gentle? How does he treat particular characters? Those maybe clues to things the readers have yet to unravel. Of course, there could be twists in stories. The well-mannered gentleman may turn out to be the murderous psychopath after all. So how can we say that his dialogues are the reflection of him? They are. He is deceitful, cunning, malicious, and his next dialogues will prove how cold, horrible or conflicted he is. 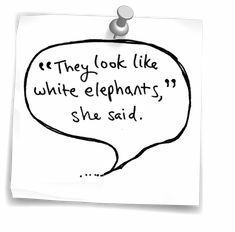 Dialogue provides white space for the reader. Not unless a dialogue is turned into a whole speech, it allows for white space. It is literally that empty space on a page that lets your eyes “breathe” or rest. They will need rest after reading loooong paragraphs. I even learned this in my journalism class in college. Dialogues being often shorter allow that break, which then allows the brain to more clearly process what has been read. Alright, so far, those are what I know. I did do a research and found more valuable information. I have collated resources and listed them down below. I suggest you pay them a visit. 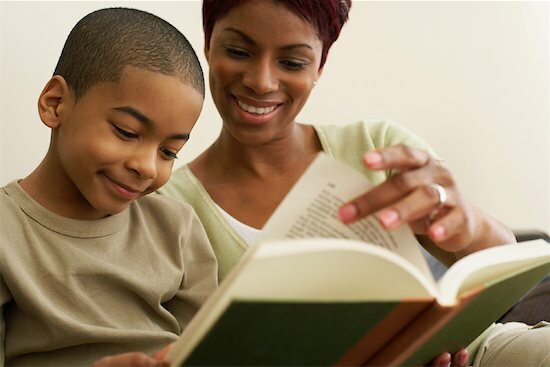 It listed down more ways dialogues help in stories, such as in making the story advance, developing the characters, increasing the story’s pace and dynamics, and showing what is happening rather than telling it. Writers shared what they know about dialogues. They may echo what have already been said here, but there are more valuable nuggets of knowledge and wisdom to be found. It is always my pleasure to share, so I am hoping you gleaned at least one thing from this post. Be back tomorrow!!! D is for “Dialogue”. Like you don’t know it yet. PFFFT. This piece serves as my Letter D post for the A to Z Challenge 2017. In the world of SEO, it’s been said many times over: Content is King. But it is not just in SEO. In fact, in general, in a world where communication is vital, quality content should definitely be top priority to get the message across. For instance, what good is a story if there is no content? I mean, even editorial cartoons have stories, right? There are contents involved, whether the words are visible, heard, and/or simply implied. Why? Because, as said, contents are needed to get the message across, to get the needed/intended results. In Marketing and Advertising, the same is true. Bad marketing and advertising are not going to get you the customers and the clients, you might as well close the business. When I was in college, we were taught that one of the most effective ways to entice viewers is to create motivational videos. This type of videos are written to appeal to the emotions. If you do it effectively, your intended audience may be motivated to buy your products or get your services. The best examples of motivational videos are commercials. Of course, there are lots of silly and downright irrelevant ones. But when it comes to commercials, you need to target the emotions, appeal to viewers’ senses, make them believe you are relevant to them. So where am I going with this? I thought I’d show you a great example of great marketing. This has to do with the trilogy of commercials Jollibee did just for this recent Valentine’s season. Jollibee is McDonald’s‘ biggest competition in the Philippines. It has actually already branched out to neighboring countries and the US. Maybe Europe even, I’m not sure. For those not in the know, Filipinos are a very sentimental bunch. Jollibee, being homegrown, knows this. They have been coming up with sentimental commercials for the longest time that have helped endear them to people. These still result to great name recall that get them the new customers–imagine, toddlers already screaming for “Jollibee! Jollibee!” whenever they see the mascot or its statue. They’d recognize the “bee” anywhere. Ask them where they want to eat, they’ll be saying Jollibee. Ask them what they want mom or dad to bring home for them and you know the answer. Now about those Jollibee Valentine’s commercials? Pure. Genius. Granted, there are a few misses that I’ve noticed, but overall, they’re great! In fact, just search for “Jollibee commercial” (or specifically type in “Vow Crush Date”) on YouTube and you’ll see a whole lot of reaction videos about these three presentations. Oh, but YOU don’t really need to, because I have shared those videos right here, just for you. Watch them, see what I mean, and you’ll get ALL the feels! THEN decide if you’ll still want to be my friend after getting all those “feels” (well, that’s what they call it now)… BTW, “kuwento” means “story”. Everytime I watch reaction videos of this series (it should be in this order so you have the happy one in the middle as some kind of buffer, at least), it never fails to make the reactors tear up. Yeah, it’s sad, but that’s an example of great marketing. Of course, how important can a fast food chain really be in your life? Not really much. But the recall, wow. Even foreigners now already know and recognize Jollibee; some of them have tried out the food since there are restos near them. I mean, how great is that? I know they made you sad, but you have to remember, these were made for Filipinos who could relate to them. 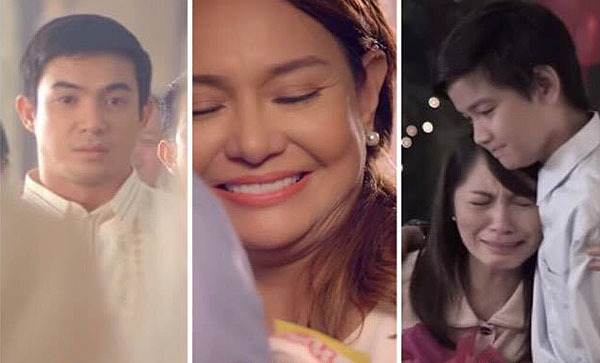 Filipinos are big on families and emotions. Besides, I also know that aside from sad, you felt various things, too. I told you, FEEEELS…. There are more heart-warming, feel-good Jollibee vids (ex. Ang Regalo ni Lolo or Grandpa’s Gift last Christmas), but this series got the most reactions. Commercials aren’t really that long here. On social media, they keep these long, but on TV where they pay millions per play, they just show complete ads for a week or two, then show the shorter versions as viewers already know the stories. The Valentine’s ones, in particular, aren’t on TV now as they were supposed to be for February. Anyway, here, I will just show one of the reaction videos. I chose this because the guys are really funny. Just fast-forward to the actual reactions part (at 7:56), if you want. Thanks to Maximum Munchies for this! So happy you’re here. Hope you liked this post (though you probably teared up a bit). Please come back tomorrow!!! C is for “Contents”…and “Commercials”, why not??? This piece serves as my Letter C post for the A to Z Challenge 2017. There’s no such thing as writer’s block. At least, that’s what Neil Gaiman and some writers say. I agree with him, in a way. But I also believe it’s all just a play of words because whether you call it ‘writer’s block’ or ‘writer getting stuck’, it’s all the same banana. It’s a temporary obstacle writers face, something most writers go through at least once in their lives. That makes it real. It exists because it happens and is experienced. A writer acknowledging he has a temporary writing problem does not necessarily make him lazy. The only question is, what must a writer do to not get stuck for long? Writer’s block is real, but we also know it can be ‘cured’ by continuing to write. What OTHER unique, specific and effective techniques have you personally done to get over it? It would be interesting to find out quirky, fun and unique ways writers battle the block. I got quite the answers from various writers, mostly published authors. There were the usual answers like the writer’s-block-is-not-real ones, there were “techniques” I was familiar with as I do them as well, and then there were the really unique ones that made my day! Read for yourselves. 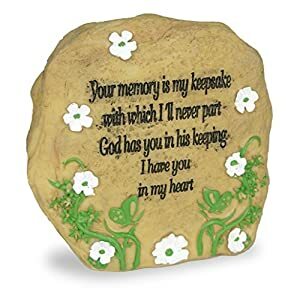 I am sharing some of them. Maybe we can try them, too. First is Larry Dixon, Fantasy and Sci-Fi writer, plus editor, among other things. Now, for the more uniquely innovative answers, we first have Elke Weiss, writer and song lyricist. Our exchange follows. And yes, she shared a recording as proof. I have linked to the recording, just click on the screenshot. Jeremy Landry is next. He’s a “moron that loves answering questions”…Hey, his words, not mine, okay?!! But he writes, too, so this is legit. Very interesting! Sometimes I do that, but not to that extent. I don’t think he mentioned anything about being in theatre, but I wouldn’t be surprised. If you’re a writer doing that, you better make sure you are alone. Meanwhile, John Morris is a Creative Scientist, at least that’s how he describes himself. He does have very practical tips for writers. Kamila Miller is very generous in giving practical advice, after all, she has had much experience as EM Prazeman (for historical fantasy fiction), Tammy Owen (for memoirs), and KZ Miller or Kamila Miller (for contemporary fantasy and short stories). I did break down her answer in parts. And then we have Adam J. Taylor, writer and a whole lot of other things–Sherlockian, Fannibal, TFOL, Partial Whovian, etc. There were more answers shared that I’m not able to post here. How about you, how do you go around the writer’s block? Please feel free to share! If you are curious about what the others had to say, you can find the whole Q&A page HERE. This piece serves as my Letter B post for the A to Z Challenge 2017. The written language is most important in writing.Without it, we’d all be like cavemen drawing stories, probably even opinions, on walls, tree trunks, leaves…I imagine there would be much more confusion in this already-confused world. Of course, there would be the spoken language, probably mostly grunts coupled with hand gestures. We’d probably be fighting over and over due to sound and gesture misinterpretations. 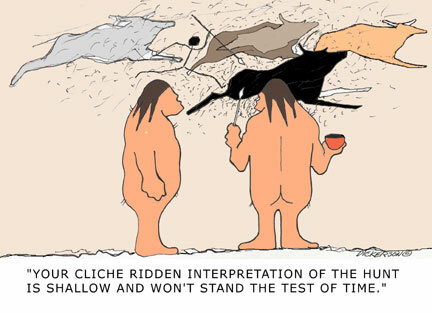 I mean, cave paintings are now art, but isn’t art subject to various interpretations? Beauty is in the eye of the beholder, in a manner of speaking. An uncivilized society with no history, that’s exactly how the country’s Spanish conquerors made the natives, our land’s indigenous people and my ancestors, believe they had. After all, we all used to be made up of tribes that practiced pagan beliefs. For around 400 years, they called us ‘indios’, their colonial and discriminatory racial term for us. The conquistadors made us believe our forefathers were illiterate prior to their arrival. The better to reign over us, right? Illiterate with no social identity, though? That was the biggest lie Spain gave us. 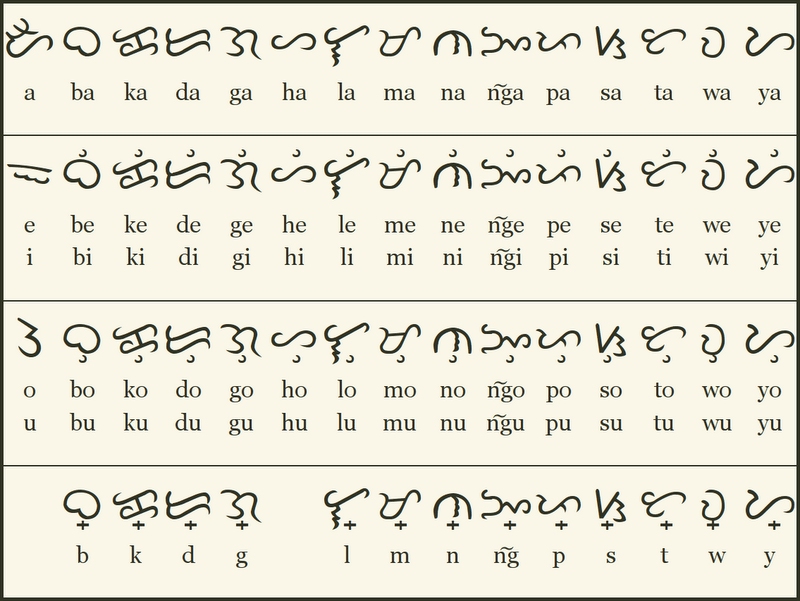 Before they came barging in, we already had our own ancient writing system, the baybayin, also and more popularly known as alibata. Pre-Spanish era, we were not yet Filipinos. I say this for the simple reason that Filipinas–the Philippines–was named after Spain’s ruler Haring (King) Felipe once they conquered us. The whole truth was, we were an already-learned people with our own history, as proven by our writing. What I meant by “the style I’m using” was that I was/is following the altered version created by a Spaniard that adds the cross sign to indicate that a character is to be read as a simple consonant–“pa” is simply read as “p”. Meanwhile, our writing system did not have any R-sound so one of the usual things done, which I follow, was/is to use the “da” or the “la” character instead. I am very partial to the second one because I find it prettier, to be honest. The Mandirigma Research Organization‘s site should be able to tell you much more, so I recommend that you refer to it. Another popular character, the “Ka”, is another fave of mine. It was used in one of the flags of the Philippine Revolution, by the revolutionary group called Katipunan. Now I know what that image on the flag symbolized. Check out how I did my name (Jennifer Federizo Enriquez) and my alias (Li’l Dove Feather) respectively using a generator I just found. Nice, eh? When I wrote the post mentioned above, I actually offered to write readers’ names for them if they requested it in the comments. It was a total hit, I tell you. That second image you see on this post is my handwriting in ali–oops–I mean, baybayin! Like I said, I aim to be a baybayin advocate. In fact, in the story I am working on, the alibata/baybayin is mentioned. “…It was proof that unlike what the Spaniards claimed, Filipinos were not an uncivilized race before they arrived and conquered. It was only what they made everyone believe. Our literary world has suffered for centuries and it’s time to bring back pride for what we can do and continue our history!…But for now, you can bet that the writing system will figure more in my story’s chapters to come. We always start somewhere. My own personal logo, in various renditions. It honestly does not strictly follow the writing system’s spelling rules. I’ve just stylized my logo. The above character, yet another one of my favorites, says “G” (meaning me, Gi); the one below says “pi” because no matter what happens, I’m proud to be Pinoy! By the way, all rights reserved to me, J.Gi Federizo, except for images and quotes that are linked to the right sources. I had original sources in 2008 as well, but the links are gone, and Mandirigma.org shares enough and proper information already, so my thanks to the whole research organization. Also, DISCLAIMER: This post does not aim to spread hate against Spain or any other country. We are not accountable for whatever bad deeds our forebears did during their time. A is for “Alibata”, otherwise known as “Baybayin”. This piece serves as my Letter A post for the A to Z Challenge 2017. Finally! I had been visiting their site several times already, but no word from them until last January 30. The news is, well, they will announce it on February 6, whatever that is. Oh, the suspense! 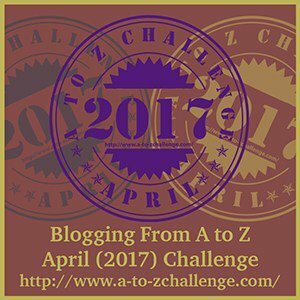 So for all of you bloggers/writers out there who would like to be more prolific, are looking to meet new friends in the blogosphere, or are hoping to be somewhat recognized for your work, why not start with the A to Z Challenge? It’s not a contest, mind you, but a community of bloggers/writers who join for a specific goal: to write on topics that start from A to Z for the whole month of April, Sundays not included. I will be very bold to guess that the announcement will include something that has to do with the number of April days this year as I checked more than a week prior and April is one-letter short. Visit the site and sign-up to join. Don’t worry, it’s all free. Do read the guidelines as well…Happy blogging! Prayers for YOU, my little ones. Mama and Papa love you both. Please tell God to send us another sister for your kuyas. This time, please tell Him to let her stay for good. I know why they call it the Bucket List. Popularized by a Morgan Freeman and Jack Nicholson movie (which I liked, by the way), it referred to a list we all used to refer to as Things to Do Before I Die. Before I kick the bucket, to be more figurative yet clear about it. 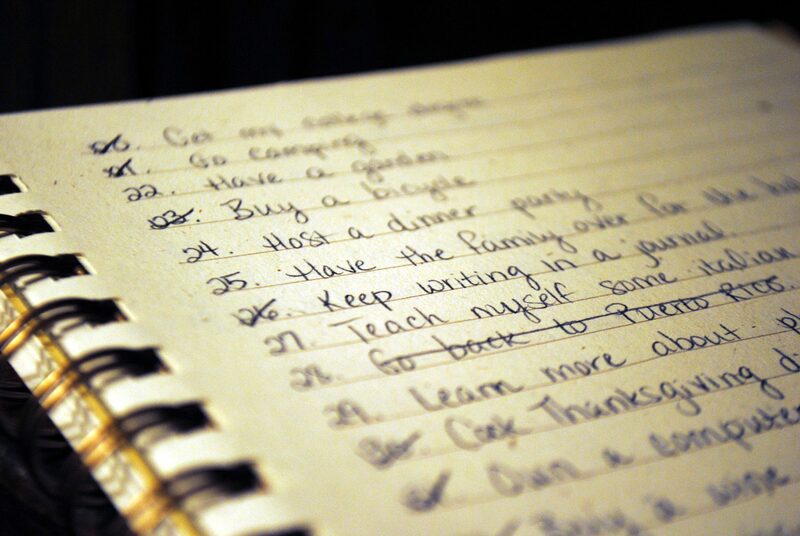 It’s a list of things you just have to do in this lifetime. If you’ll believe every person that makes one, there should be no room for doubts, no ifs, no buts. Somehow, it seems like a race against time, trying to do everything that’s on the list because, really, who knows when you’re going to die? I’ve always wanted to write down my own list since I was young, but I haven’t gotten around to doing so. I guess now is as good a time as any. I’m not going to call it Bucket List, though. Understandably, we all have wishes, goals, ambitions, and I do, too. But I am not going to stress myself to death over them. If it’s my time to die, then so be it. I won’t let the bucket hit me back on the head on my way ‘out’. (I know, I know, that’s not how to say it. It does seem appropriate, ‘no?) I believe that if you get too caught up trying to accomplish everything that’s on the list, you just might forget the other things that should really matter to you. Too many lists I see that are all about ME, ME, ME. Anyway, my next post is my list and I’m calling it…hmnn…MY HAPPY LIST. Seriously, I just came up with that one now. Sorry it’s not so literary-sounding or deep. If you can suggest a more proper name for my list, please share 🙂 If an item is crossed out like THIS and in red, consider that done and virtually marked with an “X”. I’ve been house-bound for days and will continue to be in the coming weeks. But I refuse to just keep lying down or sitting down doing nothing or staring into space or, worse, crying and staying depressed. So I try to keep busy. Of course, I don’t overdo, don’t worry. So what’s up with me? TV. There are actually not so much interesting stuff to watch on regular channels. Too bad we don’t have cable. It won’t be practical for us, anyway. But I’ve been watching way too much kiddie shows for my own good, I’ve found myself singing along to Hi-5 songs. Books. 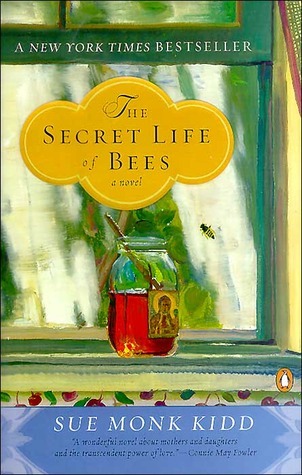 I finally had time to finish The Secret Life of Bees by Sue Monk Kidd last week (I liked the movie as well, just want to say). I am now reading the same author’s work, The Mermaid Chair. Taking it in stride. 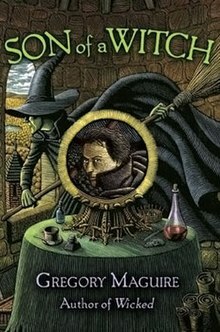 Once finish, I’ll most probably read the second book of the Wicked novel series titled Son of a Witch by Gregory Maguire, even if I haven’t yet read the first (hey, I don’t have a copy, alright?). 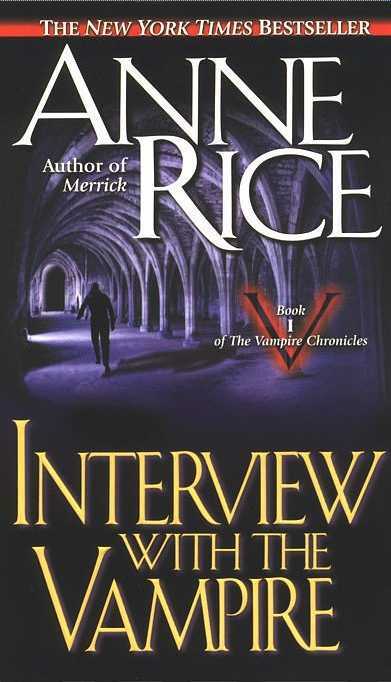 THEN I’ll continue my on-and-off reading of Anne Rice’s Interview with a Vampire. I was on it last year till I found out I was pregnant. Didn’t know if reading it would not affect the baby, but I did not want to risk it (so much for that). Write. Well, I haven’t done much yet, but I’m trying. I have to go back to the me that I knew. Blogging is one way to do it. And I am about to continue with my long-time and long-neglected story, even if it means doing longhand. Organization. I am not allowed to do much work (husband too strict — hate it but love him for it at the same time). So just little by little, I sort things out, stuff I haven’t had much time to take care of when I was busy working. It’s great ’cause organization is something we haven’t done well for months. It’s what makes me feel more me. Home-tutoring. Not really homeschooling but kind of. School’s out but we need to prepare our recent-kindergartner for his exam this May that’s supposed to test if he’s ready for the first grade. Personally, I know he is and he’s actually smart, but then you can’t be too complacent as you never really know what they’re going to ask the kid to do or answer. We do think we have the right ideas so I try to teach him base on those and try to add more ideas. This serves as my “W” post for the 2015 A to Z Challenge. It’s April. I vowed to finish the A-to-Z Challenge, which became my personal challenge the whole year, but still, here we are. I would’ve already finished had I not gone through something last week. Yet, here I am, fulfilling something I promised myself, something that’s gonna keep my mind off things and also gonna help me move on. Anyway, for my “V” post, I am sharing the videos that have entertained me a lot these past months. Hope you like these vids!!! !